I saw a white 1980 or 1981 Z28 with blue graphics (I believe the only way you can tell them apart is to get close enough to see the length of the VIN) out driving today, not once but twice. It wasn’t quite in show condition, but it still looked pretty sharp, and you so rarely see these cars on the road in 2014. We’ll go with the 1980 version for this post because it had slightly more horsepower. 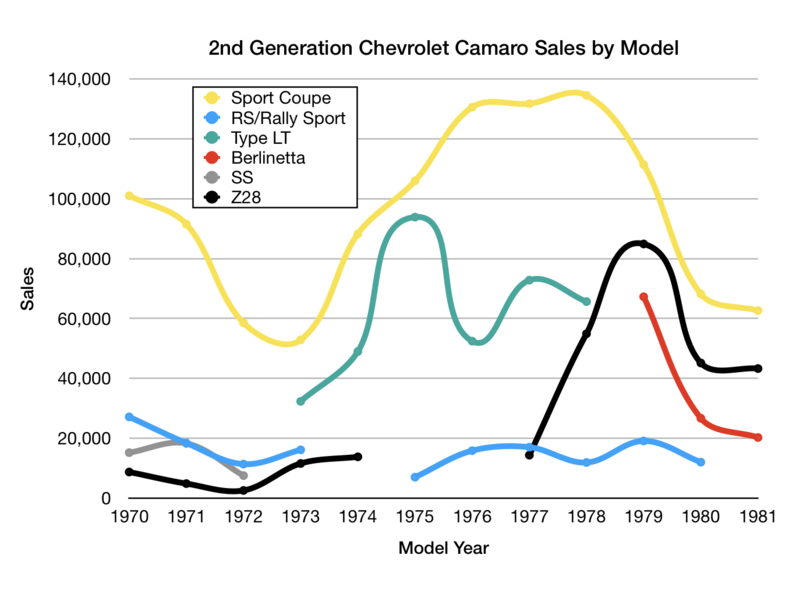 For 1980, the aging second-generation Chevrolet Camaro (the title of Car and Driver‘s road test for the 1980 Z28 was a cruel “A medieval warrior on the path to a rocking chair“) received some updates, including exterior styling changes and a more powerful engine for the Z28. Not much could be done about the general lack of space efficiency, the high weight, and the fairly primitive technology. 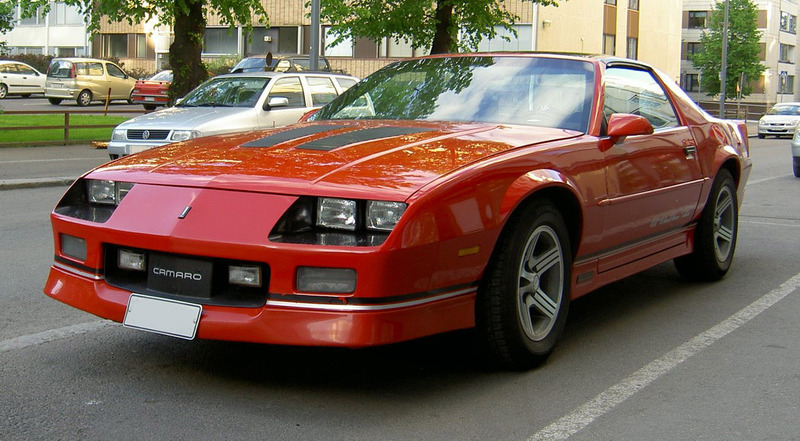 The standard (and only) Z28 powertrain for states other than California was the LM1 5.7 liter/350 ci V8 with a four-barrel Rochester carburetor and 8.2:1 compression matched with a four-speed manual transmission. At 190 bhp, this engine had the most horsepower that had been seen in a Camaro since 1974 (sigh). For 1980, a solenoid-driven air intake was added to the back of the redesigned hood scoop. Car and Driver managed to get the 3,660 pound Z28 from 0-60 in 8.5 seconds with a top speed of 120 mph. Fuel mileage was predictably bad—14 city/21 highway by the standards of the day. 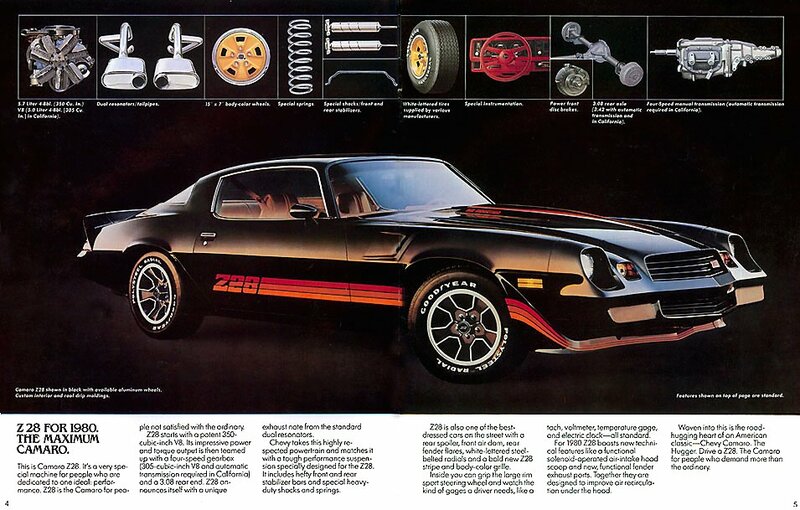 Standard exterior and mechanical equipment included in the $7,121 base price of the Z28 (about $20,500 in today’s dollars) included heavy duty shocks and springs, sport mirrors, a front air dam, a rear spoiler, body-colored wheels, and white-lettered radial tires. 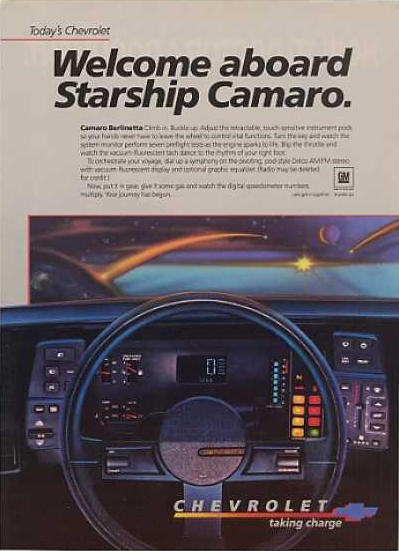 Inside, power steering, full gauges, center console, cut-pile carpeting, and vinyl bucket seats were standard. External options included 15 x 7 aluminum wheels ($184) and removable glass roof panels ($695). Inside, you could add air conditioning ($566), intermittent windshield wiper system ($41), electric rear window defogger ($107), automatic speed control ($112), power door locks ($93), power windows ($143), Comfortilt steering wheel ($81), and an AM/FM stereo radio with stereo cassette tape ($272). 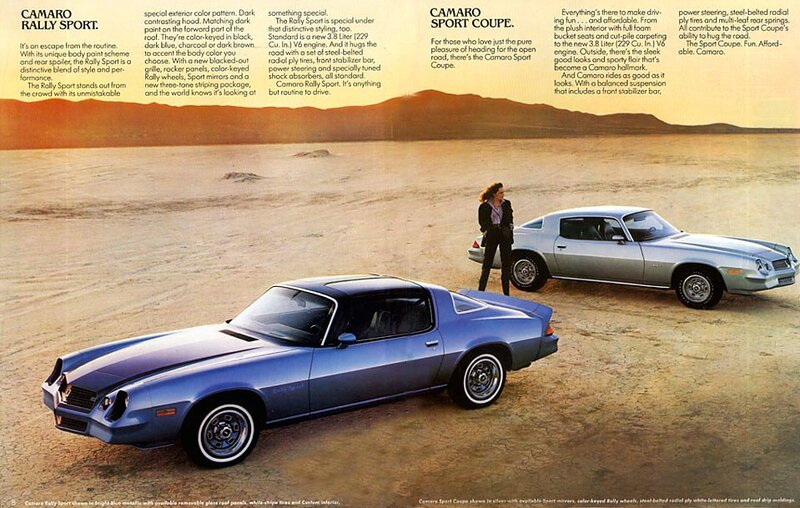 Z28 page from the 1980 Camaro brochure, linked from the Old Car Manual Project’s amazing brochures section. Long neglected by the collector market and with most now used up, late second-generation Z28s in good or great shape are starting to get interesting numbers at auctions. A red 1980 Z28 went for $13,000 at Mecum’s January 2014 auction in Kissimmee. According to Hagerty’s valuation tools, all the money for a 1980 Z28 in #1 condition is $26,800. A more normal #3 condition version is valued at $13,100. Make mine red, I think. Surprisingly, the most popular color in 1980 was dark blue.